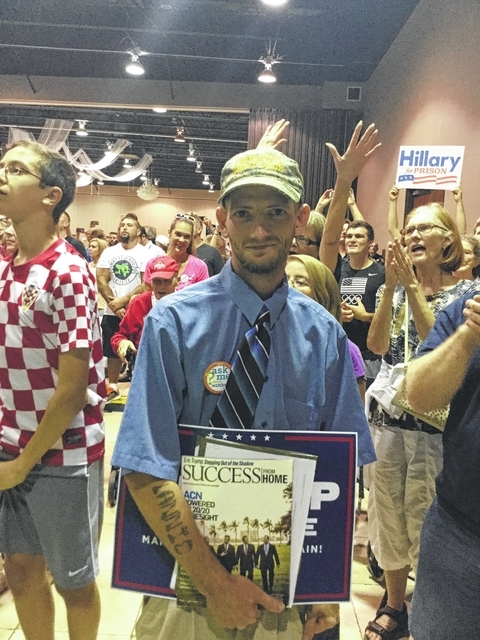 Supporters of Donald Trump’s bid for the presidential election said they like his immigration policies during interviews last week at the rally in Wilmington. And those who support Trump building a wall between the United States and Mexico all said they like that idea because they think it might stop drugs from coming into southern Ohio. Stephen Trimble, 29, from Washington Court House, said Trump endorsed the company he works for; at least he did before he started to run for president. When asked what he thought of Trump’s immigration policies, Trimble said he hadn’t really heard a whole lot about it. Trimble said he thinks if illegal immigrants are already here in the United States and they’re going through the steps to become naturalized citizens, they should be allowed to stay. But he said immigrants who don’t want to go through the steps to be here, they should go back. But more than that, Trimble said he thinks the wall will help to stop other problems from coming into the United States—drugs—a message that resounded throughout many of those in attendance at the Wilmington rally. “I honestly think that if we build the wall it will enforce the illegal immigration problem and hopefully stop the drug trafficking,” said Trimble. Jo Johnson, from Blanchester, said she likes the things Trump is doing because she thinks he is going to make America greater. “He says he’s securing the border from people coming here and doing bad things to the Americans,” said Johnson. 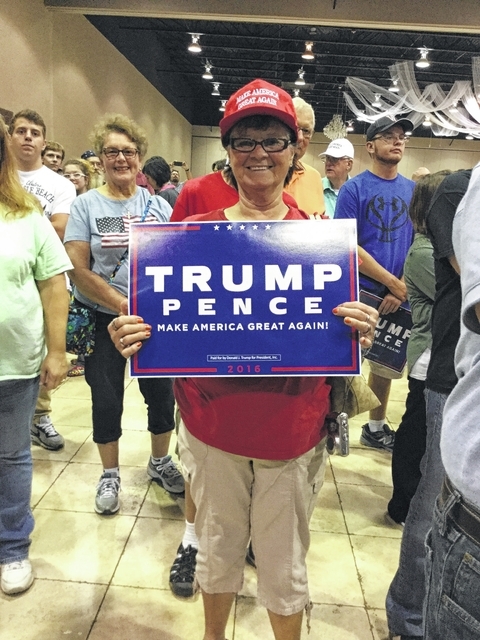 Many people had been waiting for Trump to be in southern Ohio so they could see him in person, like 66-year-old Cheryl Darrah, who drove from Beavercreek to attend the rally. “I think we have to close our borders and get our country straightened out. The drugs came in over the border. They just need to be stopped,” said Darrah. The epidemic of drugs—heroin, carfentanil, fentanyl, and methamphetamine—is rampant throughout neighborhoods across the country with southwest Ohio seeing a splurge of overdose spikes in the past three-to-five years. “I think they should put a wall up to keep the drugs from coming in and the people that are not citizens—so they can turn around and do what they need to do to become a U.S. citizen,” said Greg Stevens, 49, from Harveysburg, Ohio. Stevens said the main thing is to keep those drugs from coming into the country. “You get the cartels coming right in. It’s killing our children. Back in the day when I was growing up, it was just weed and today you got more stronger drugs like heroin, crack, cocaine, molly,” said Stevens. Vernon Stanforth, Fayette County Sheriff, said in an interview last week that southwest Ohio hasn’t seen the peak of the fentanyl and carfentanil epidmic yet, which he thinks will become more of an epidemic than heroin. From Chicago to Dayton, and from Dayton to smaller cities like Xenia, where 71-year-old Sandra Williamson lives. Williamson said she’s for the wall because she thinks we have too many problems right now. From Xenia, drugs are pushed further out across interstate 35 to rural communities and cities like Chillicothe, where 31-year-old Crystal Beard lives. Beard said she thinks the problem of drugs coming into the country needs to be stopped. “I think building a wall is a great idea,” said Beard. And then, there is Donald Trump himself, who said, “We have to stop the drugs from poisoning our children,” in the speech he gave at the rally. “We are going to build that wall,” said Trump.